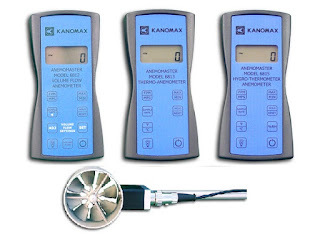 Kanomax 6815 Vane Anemomaster with Temperature / Humidity is an extremely accurate rotating digital vane anemometer that measures Air Velocity and Temperature. The Kanomax 6815 Vane Rotating Anemometer features a large backlit display with data HOLD, Record and recall MAX/MIN. 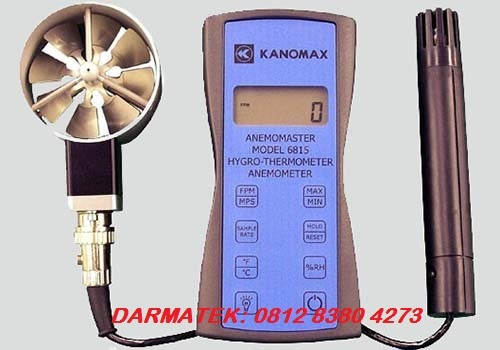 Darmatek is Kanomax 6815 Vane Rotating Anemometer Sales Online Shop, survey tool. We are here as a supplier of land or building survey equipment, telecommunications survey tools, geological surveying or mining tools, and other survey tools including Total Station, Digital Theodolite, Automatic Level, GPS, Compass, Binoculars, Monocullars, Laser Rangefinders, Night Scope, Digital Altimeter , Clinometer, Tandem, Digital Planimeter, Distometer Speed ? ?Gun, Measuring Wheel, Measuring Tape, Grounding Tester, Handy Talky HT, Sound Level Meter, and Geological tools, PH Meters, Lux Meters, Anemometers, Thermohygrometers, Thermometers, Sirens, etc. Surabaya, Bali, Sidoarjo, Malang, Semarang, Yogyakarta, Pekalongan, Cirebon, Tangerang, Jakarta, Bandung, Sumatra, Aceh, Lampung, Medan, Riau, Kanomax 6815 Vane Rotating Anemometer, Batam, Jambi, Padang, Kalimantan, Samarinda, Pekanbaru, Bengkulu, Makassar, Sulawesi, Irian Jaya, Papua, Bangka Belitung, Banten, West Java, Central Java, East Java, NTT, NTB, Gorontalo.